The Renaissance choir Blue Heron will be presenting three concerts in the next three days devoted to music of Johannes Ockeghem. Relatively obscure to Boston concertgoers today, in his own time he was well known and much admired, both for his beautiful singing voice and for his finely wrought compositions. The program, “Divine Songs,” including French songs and sacred music based on them, will take place on Thursday at 8:00 in Boston College’s Gasson Hall, on Friday at 8:00 at Boston University’s Castle, and at First Church Congregational in Cambridge on Saturday at 8:00. Participants will include Scott Metcalfe, director, harp & medieval fiddle; Pamela Dellal, Paul Guttry, David McFerrin, Owen McIntosh, Jason McStoots, Martin Near, Mark Sprinkle and Sumner Thompson, voices; Laura Jeppesen, rebec and medieval fiddle. Blue Heron’s website is here. 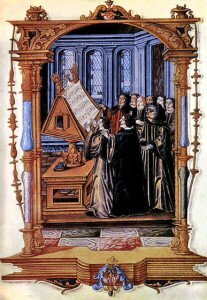 Born probably in Flanders around 1410, Ockeghem was established at the French royal court at Tours by 1452, served a succession of French kings, and associated with many of the important composers of his day. At his death in 1497 he was eulogized in lofty tones by the French poets Guillaume Crétin and Jean Molinet as well as by the Dutch humanist Erasmus. BMInt had several questions for Scott Metcalfe which he preferred to answerer by sharing his program notes which I append here. And to bring us back home again: On All Souls Day some years ago I attended the Requiem Mass, originally endowed by Isabella Stewart Gardner, at the Church of the Advent. At one point in the service, members of the congregation were invited to name departed friends and relatives whom they would like to have remembered. Amid the sonorous Boston Brahmin names that of “Johannes Ockeghem” rang out loud and clear. I was told afterwards that one of the parish priests at the Advent claimed descent (collateral) from the composer. I just telephoned 808 Gallery. The venue has been changed to the Castle, 225 Bay State Road, Friday, 8 p.m., with lecture at 7:15. Admission is free.